Using its infrared vision to peer nine billion years back in time, the NASA/ESA Hubble Space Telescope has uncovered an extraordinary population of tiny, young galaxies that are vibrant with star formation. The galaxies are churning out stars at such a rate that the number of stars in them would double in just ten million years. For comparison, the Milky Way has taken a thousand times longer to double its stellar population. These newly discovered dwarf galaxies are around a hundred times smaller than the Milky Way. Their star formation rates are extremely high, even for the young Universe, when most galaxies were forming stars at higher rates than they are today. They have turned up in the Hubble images because the radiation from young, hot stars has caused the oxygen in the gas surrounding them to light up like a fluorescent sign. The puny galaxies, shown in the postage-stamp-sized images, existed 9 billion years ago and are brimming with star birth. The dwarf galaxies are typically a hundred times less massive than the Milky Way galaxy but are churning out stars at such a furious pace that their stellar population would double in just 10 million years. Hubble’s Wide Field Camera 3 and Advanced Camera for Surveys spied the galaxies in a field called the UKIDSS Ultra Deep Survey, or UDS, (part of the UKIRT Infrared Deep Sky Survey). The galaxies stood out in the Hubble images because the energy from all the new stars caused the oxygen in the gas surrounding them to light up like a bright fluorescent sign. Astronomers believe this rapid starbirth represents an important phase in the formation of dwarf galaxies, the most common galaxy type in the cosmos. "The galaxies have been there all along, but up until recently astronomers have been able only to survey tiny patches of sky at the sensitivities necessary to detect them," says Arjen van der Wel of the Max Planck Institute for Astronomy in Heidelberg, Germany, lead author of a paper that will appear in a forthcoming issue of the Astrophysical Journal. "We weren't looking specifically for these galaxies, but they stood out because of their unusual colors." The observations were part of the Cosmic Assembly Near-infrared Deep Extragalactic Legacy Survey (CANDELS), an ambitious three-year survey to analyse the most distant galaxies in the Universe. CANDELS is the first census of dwarf galaxies at such an early epoch on the Universe's history. "In addition to the images, Hubble has captured spectra from a handful of these galaxies that show us the detailed physics of what's happening within them and confirm their extreme star-forming nature," says co-author Amber Straughn at NASA's Goddard Space Flight Center in Greenbelt, USA. The observations of ancient galaxies are somewhat at odds with recent detailed studies of the dwarf galaxies that are currently orbiting the Milky Way. 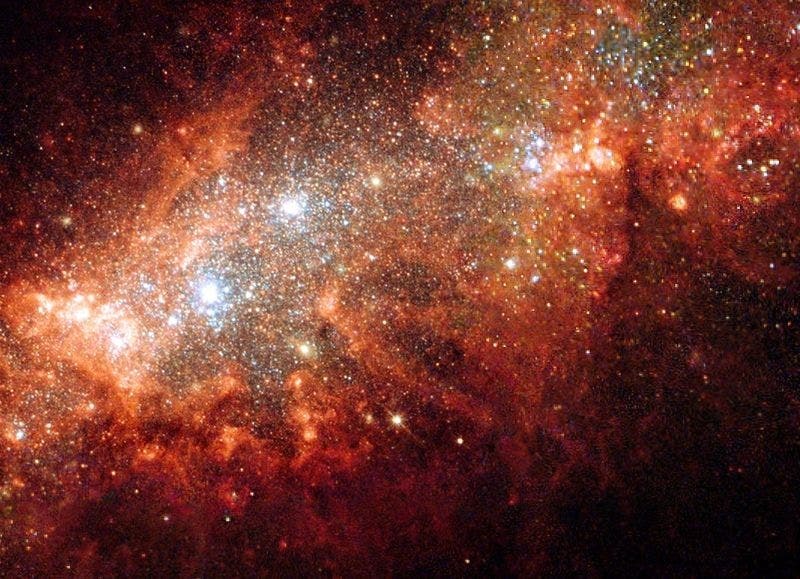 "Those studies suggest that star formation was a relatively slow process, stretching out over billions of years," explains Harry Ferguson of the Space Telescope Science Institute (STScI) in Baltimore, USA, co-leader of the CANDELS survey. "The CANDELS finding that there were galaxies of roughly the same size forming stars at very rapid rates at early times is forcing us to re-examine what we thought we knew about dwarf galaxy evolution." Team member Anton Koekemoer, also of STScI, who is producing the Hubble imaging for the survey adds: "As our observations continue, we should find many more of these young galaxies and gather more details on their star-forming histories." The CANDELS team uncovered the 69 young dwarf galaxies in near-infrared images taken with Hubble's Wide Field Camera 3 and Advanced Camera for Surveys. The observations concentrated on two regions of the sky called the Great Observatories Origins Deep Survey-South and the UKIDSS Ultra Deep Survey (part of the UKIRT Infrared Deep Sky Survey). The observations suggest that the newly discovered galaxies were very common nine billion years ago. But it is a mystery why the newly found dwarf galaxies were making batches of stars at such a high rate. Computer simulations show that star formation in small galaxies may be episodic. Gas cools and collapses to form stars. The stars then reheat the gas through, for example, supernova explosions, which blow the gas away. After some time, the gas cools and collapses again, producing a new burst of star formation, continuing the cycle. "While these theoretical predictions may provide hints to explain the star formation in these newly discovered galaxies, the observed 'bursts' are much more intense than those reproduced by the simulations," says van der Wel. The NASA/ESA/CSA James Webb Space Telescope, an infrared observatory scheduled to be launched later this decade, will be able to probe these faint galaxies at an even earlier era to see the glow of the first generation of stars, providing detailed information of the galaxies' chemical composition. "With Webb, we'll probably see even more of these galaxies, perhaps even pristine galaxies that are experiencing their first episode of star formation," Ferguson says. "Being able to probe down to dwarf galaxies in the early Universe will help us understand the formation of the first stars and galaxies."